Mobile robots could be much more useful in homes, if they could locate people, places and objects. Today's robots usually see the world with cameras and lasers, which have difficulty reliably recognizing things and can miss objects that are hidden in clutter. A complementary way robots can "sense" what is around them is through the use of small ultra-high frequency radio-frequency identification (UHF RFID) tags. Inexpensive self-adhesive tags can be stuck on objects, allowing an RFID-equipped robot to search a room for the correct tag's signal, even when the object is hidden out of sight. Once the tag is detected, the robot knows the object it's trying to find isn't far away. "But RFID doesn't tell the robot where it is," said Charlie Kemp, an associate professor in Georgia Tech's Wallace H. Coulter Department of Biomedical Engineering. "To actually find the object and get close to it, the robot has to be more clever." That's why Kemp, former Georgia Tech student Travis Deyle and University of Washington Professor Matthew Reynolds developed a new search algorithm that improves a robot's ability to find and navigate to tagged objects. 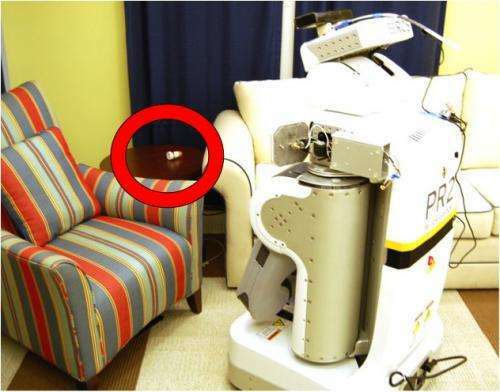 The team has implemented their system in a PR2 robot, allowing it to travel through a home and correctly locate different types of tagged household objects, including a medication bottle, TV remote, phone and hair brush. The research was presented September 14-18 in Chicago at the IEEE/RSJ International Conference on Intelligent Robots and Systems (IROS). The researchers have equipped a PR2 robot with articulated, directionally sensitive antennas and a new algorithm that allows the robot to successfully find and navigate to the intended object. Due to the physics of radio-frequency propagation, these antennas tend to receive stronger signals from a tag when they are closer to it and pointed more directly at it. 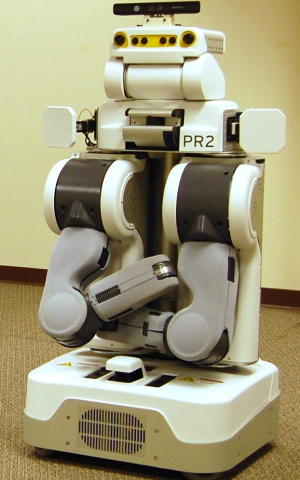 By moving around the antennas on its shoulders and driving around the room, the PR2 can figure out the direction it should move to get a stronger signal from a tag and thus become closer to a tagged object. In essence, the robot plays the classic childhood game of "Hotter/Colder" with the tag telling the PR2 when it's getting closer to the target object. In contrast to other approaches, the robot doesn't explicitly estimate the 3D location of the target object, which significantly reduces the complexity of the algorithm. "Instead the robot can use its mobility and our special behaviors to get close to a tag and oriented toward it," said Deyle, who conducted the study in Kemp's lab while earning his doctoral degree in Electrical and Computer Engineering from Georgia Tech. 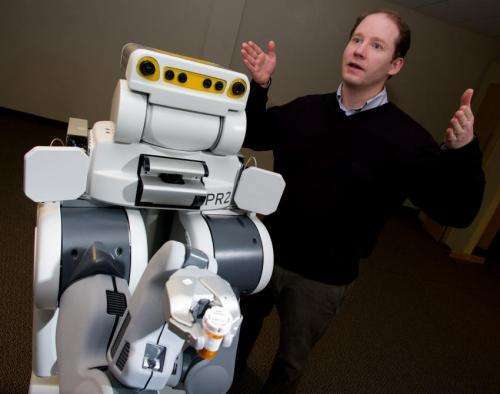 "This could allow a robot to search for, grasp and deliver the right medication to the right person at the right time," he added. "RFID provides precise identification, so the risk of delivering the wrong medication is dramatically reduced. Creating a system that allows robots to accurately locate the correct tag is an important first step." Reynolds added, "While we have demonstrated this technology with a few common household objects, the RFID tags can uniquely identify billions of different objects with essentially zero false positives. This is important because many objects look alike, yet must be uniquely identified – for example, identifying the correct medication bottle that should be delivered to a specific person." "With a little modification of the objects in your home, a robot could quickly take inventory of your possessions and navigate to an object of your choosing," said Kemp, a professor in Georgia Tech's School of Biomedical Engineering. "Are you looking for something? The robot will show you where it is."